Habit: Perennial herb, shrub, sparsely or densely strigose or +- silky, green or gray. Stem: decumbent to ascending, 5--20 dm. Leaf: irregularly pinnate; stipules gland-like; leaflets 7--15 mm, elliptic to obovate. Inflorescence: 3--10-flowered, peduncle 0 or 2--10 mm. Flower: calyx 4--6 mm, lobes < tube, thinly strigose to +- glabrous; corolla 8--12 mm, yellow, wings +- = keel, stigma glabrous. 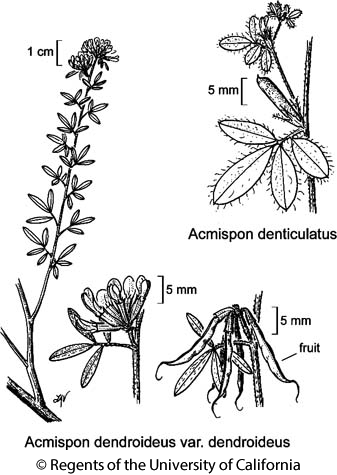 Fruit: indehiscent, divergent to descending, soon-exserted, oblong-tapering, straight or curved, not flat; beak narrow, abruptly curved, 2--3 mm. Chromosomes: 2n=14. Note: Island-to-island variants recognized variously; the following distinct in morphology, geography. Leaf: leaflets 3--5, finely or sparsely strigose, +- green. Inflorescence: peduncle bract 0. Fruit: 1--1.5 cm. Citation for this treatment: Luc Brouillet 2012, Acmispon dendroideus var. dendroideus, in Jepson Flora Project (eds.) Jepson eFlora, http://ucjeps.berkeley.edu/eflora/eflora_display.php?tid=91805, accessed on April 24, 2019. ChI (exc San Miguel, San Clemente islands). Markers link to CCH specimen records. Yellow markers indicate records that may provide evidence for eFlora range revision or may have georeferencing or identification issues. Purple markers indicate specimens collected from a garden, greenhouse, or other non-wild location.